Standalone Server detail view displays info collected from the standalone Server. The info is grouped in several panels. The following panels are displayed by default. You can display the hidden actions with Actions button: choose Actions → Show details. Resource Utilization panel shows the amount of used System memory, System disk swap Server Core heap memory, Server Core non-heap memory, Worker heap memory and Worker non-heap memory. Contain basic information about Worker and operating system. The Performance panel contains a chart with three basic performance statistics: a number of running jobs, amount of used up Server and Worker heap memory. The graph displays values gathered within a specific interval. The interval can be set up with the combo box above the graph or configured by the cluster.node.sendinfo.history.interval config property. Note that the heap memory is constantly oscillating, even in idle state, since it is periodically managed by JVM garbage collector (i.e. the temporary data required for running CloverDX Server and Worker is periodically removed from/allocated to the heap memory). The CPU Load panel displays a chart with info about total CPU load and CPU load caused by JVM (both Core Server and Worker). Running jobs panel lists currently running jobs, 10 most recent runs are displayed. 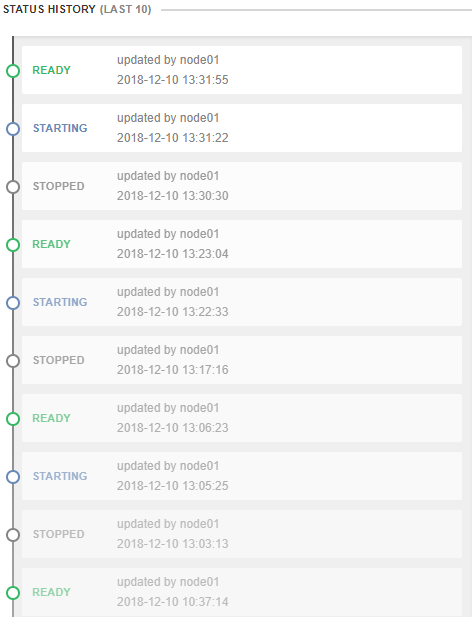 Status history panel displays node statuses history since restart of the Server. This panel lists info about activities on files performed by users. The list displays a timestamp of an event, username, address and name of the method. Classloader cache lists all currently cached classloaders. The classloader cache may be empty as classloader caching is disabled by default. Status panel displays current node status since last server restart. 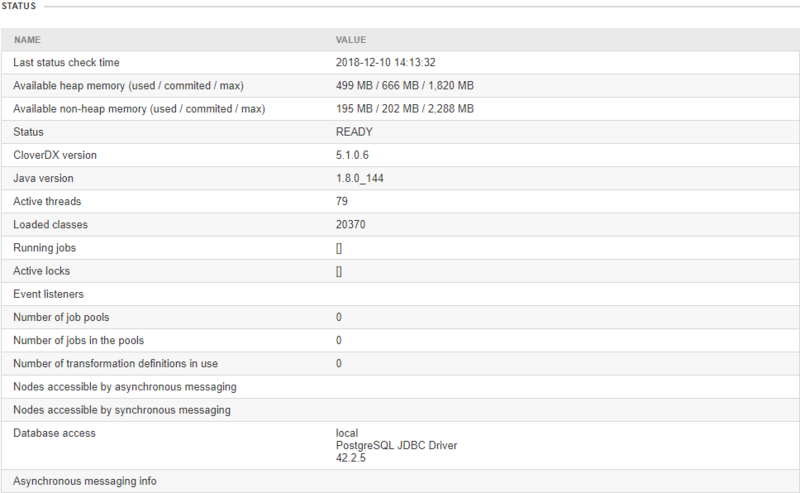 It displays current server status, exact Java version, exact CloverDX Server version, way of access to database, etc. Provides information about CloverDX Server utilization of operating system resources. Heartbeat panel displays a list of heartbeat events and their results. Threads panel lists Java threads and their states. Quartz panel lists scheduled actions: their name, description, start time, end time, time of previous event, time of next event and expected final event.